Diarmuid was the young lieutenant of Finn, the now aging hero and leader of the Fianna. At a banquet Grainne, who was at the time betrothed to Finn, fell in love with the young hero Diarmuid. She placed him under a geis so that he would be compelled to take her from Tara. Therefore Diarmuid fled Tara with his leader’s fiancée. Diarmuid faced the double-edged sword of betraying the geis or betraying his leader. He took Grainne into exile and they fled the Fianna who pursued Diarmuid to win Grainne back for Finn. The couple were chased all over Ireland, but Diarmuid was assisted by the god of love, Oenghus. They entered the forest of Duvnos which contained the tree of Immortality. In the forest a giant, Sharavan the Surly, guarded the tree of Immortality, and Diarmuid made an agreement with him that Sharavan would leave the lovers in peace if Diarmuid and Grainne did not take any of the berries from the tree. But Grainne soon persuaded Diarmuid to pick berries and he killed Sharavan in the process. Soon Finn and his men caught up with the pair, and they entered the forest. Finn knew that they were hiding in the tree of Immortality but decided to try to draw Diarmuid out. He and Oisín played chess beneath the branches and Diarmuid couldn’t resist dropping a berry onto the board to signify to Oisín which move to make. Having been assured that Diarmuid was indeed amongst the branches, Finn sent Garva up to kill him. But Diarmuid won and threw the body down. But Oenghus changed his appearance so that Finn believed the body thrown to the ground was in fact Diarmuid. Diarmuid’s death occurred when he was involved in a boar hunt. He was fated to be killed by the animal and indeed was struck during the hunt. But Finn had in his possession the ability to save him, if he helped Diarmuid to drink from his hands. Twice Finn let the water slip through his fingers. On the third occasion he relented and brought water to him, but it was too late. 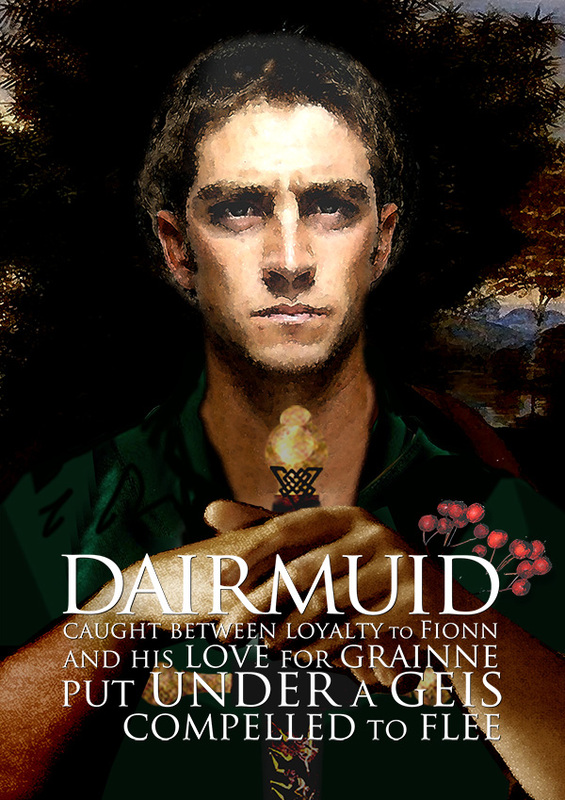 Diarmuid’s loyalty was split between Grainne and Finn, and he was pulled into a conflict that was not of his choosing. He appears to have been an essentially good character, torn by cruel fate.